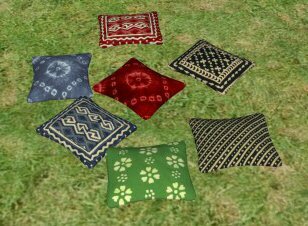 I offer you another set of recolours driven by the needs of my islander sims. There are also eighteen different cushions to sit on. You can mix and match them to your hearts' content. They come in batik, tiki-match, furry and miscellaneous styles. Some are quite grand, while others will fit right in with your slum dwellers. (Especially if they are island slums.) All the files are descriptively labelled, so you can get rid of any you don't want. Simcredible meshes are listed as basegame. Obviously, the table and chair meshes have been lowered. The animations on the chairs can look a bit odd as sims get up and down, and their legs sink into the floor while they are sitting - looks very amusing if you put them on a column deck! On solid ground, though, it gives a good approximation of kneeling, depending on your viewing angle and the clothing the sim wears. I am not a mesher, far less an animator, so I cannot correct the animations. Sorry. I just made the colours. 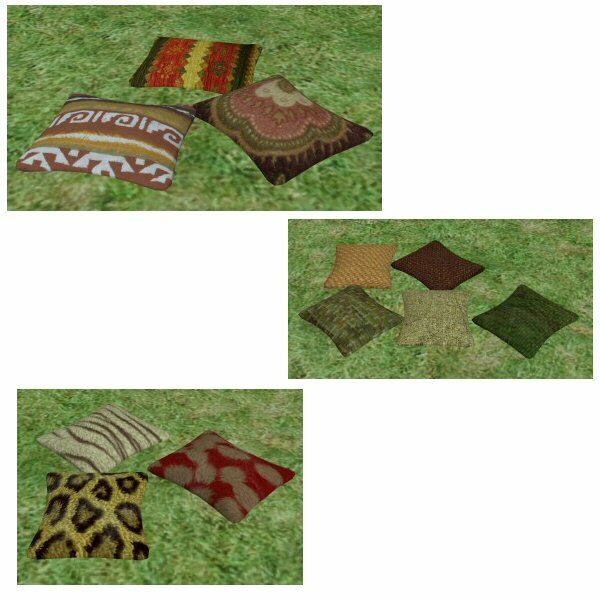 The three fur cushions use textures from a furry bedding set by Piggi, who kindly gave permission to share them in this way. All the other textures are free ones found on the internet. Full credit goes to Simcredible for making such a clever dining alternative. 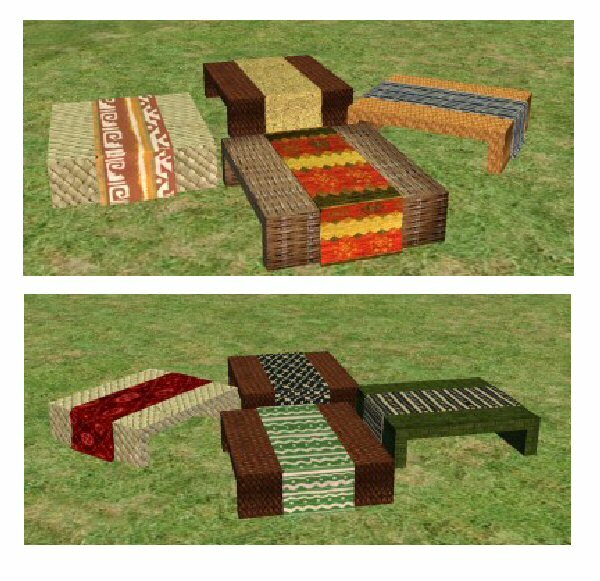 I have only seen two other lowered dining sets - one is pay at TSR, the other is by Simcredible again, but a less suitable style for this project. Thanks to both SIMcredible and Piggi for allowing their work to be used and shared. 283 people have said thanks to aelflaed for this download.